Zeropark is now integrated with Voluum! Thanks to that you can do almost everything in one dashboard, which basically means no need to flick between screens and quick bid changes on the fly. Want to know more? The what? Scope of possibilities available within the integration + walkthrough on how to perform changes. “Why Voluum?” – you may ask. To keep it short and sweet – because we’re the greatest and that’s why we integrate with the greatest. To do great things together. To give you an overview of what Voluum is – it’s a tracking solution. Being more precise, it’s a SaaS tool for performance marketing analytics, which enables you not only to monitor all your online campaigns in one place but also provides you with a bunch of features that helps you optimize your ad spend to increase the ROI. It even does some of the part of your job for you. Being the fastest tracker in the industry, with over 30 data points, Voluum tracker allows digital marketers to get more granular insights into their online campaigns. Sounds tempting? This is just a snippet of all possibilities. So, if you haven’t heard about Voluum yet, you have a lot of catching up to do. Check voluum.com and once you’re ready, move to the next step. II. How to Integrate Zeropark and Voluum Accounts? Zeropark’s integration with Voluum has 6 primary steps. It is simple and, being honest, all it takes is just a click of one red button in Voluum. Zeropark Note: Integration is possible for Zeropark users who also have an active Voluum account. If you currently don’t have a Voluum account, and you are a quite an independent person and want to do it yourself – register here. If you prefer a quick chat and assistance – contact the Voluum Team. Navigate to Settings by clicking the icon. This will redirect you to the Zeropark panel where all you need to do is fill in your Zeropark account email and password. Last but not the least, click on the Log in button to finish the process of integration. Zeropark Note: It’s only possible to have a single Zeropark account integrated into a single Voluum account. But no worries, if your Zeropark account is already integrated with another Voluum account, you will get a notification after clicking the Log in button. III. What Do You Get with the Integration? get alerts from Voluum whenever there is an issue with a campaign setup and stop wasting money on such campaigns thanks to automatic traffic cut off. And if want to setup conversion tracking with Voluum, you don’t need to use Zeropark postback URLs or tracking pixels, as your data from Voluum will be sent to Zeropark based on your client ID, so all you need to do is just set up your tracker. To start with any of the below, log into your Voluum account. External campaign column – where you can find a corresponding Zeropark campaign name. Status column – where you can check the current state of your Zeropark campaign(s). You can find the explanation of each campaign status here. Bid column – which presents the current bid that is in place for your Zeropark campaign(s). Visibility column – where the ‘Visibility’ indicator shows the strength of your campaign bid in comparison to other advertisers. Once you get familiar with all the changes, take a closer look at the actions you can take for your Zeropark campaigns directly from Voluum’s dashboard. Go to the Campaigns tab. Choose an active campaign that you want to pause by clicking the row with the particular campaign. Zeropark will then stop sending traffic to your campaign. If you want to resume the campaign, click on the campaign. You can undo this action simply by clicking the button. It will also cause an activation of the campaign on the Zeropark end. Choose the campaign that you want to archive by clicking the row with the particular campaign. Once clicked, the campaign will be archived in Voluum. It will cause a deletion of this campaign in the Zeropark account. Clicking the button will restore the campaign in Voluum only. You will no longer be able to change bids in this campaign. To restore the campaign on the Zeropark end as well, you need to log into your Zeropark panel, and from the dropdown list of actions choose . In the campaign view you will find a “Bid” column, which will usually be located next to the status column. You can also change the bid by clicking on the bid value and by typing the new amount for the bid. Thanks to the integration, you can select individual or multiple rows to perform further actions. In order to select an individual row or rows, click on the checkboxes located on the leftmost margin of what’s displayed. Select all rows by clicking on the checkbox at the top of the table. All elements will be selected. Once selected, perform a desired action: activate, pause, change bids. Within Zeropark campaign reporting in Voluum, it’s also possible to pause / resume specific target traffic variables as well as to change bids per different custom variables. You can do it in bulk or individually by selecting a particular data row. Zeropark Note: The traffic variables which can be paused / resumed are dependent on the initial targeting that was set for the particular campaign in Zeropark. 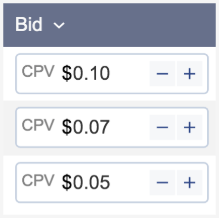 For example, if your Zeropark campaign type allows you to bid on preselected subids or on specific URLs, it is possible to change bids of each target through Voluum. You can do so via the target (custom variable) report (usually V1). Remember, if you currently don’t have a Voluum account and want to get one to integrate it with your Zeropark account, you can register your account here.